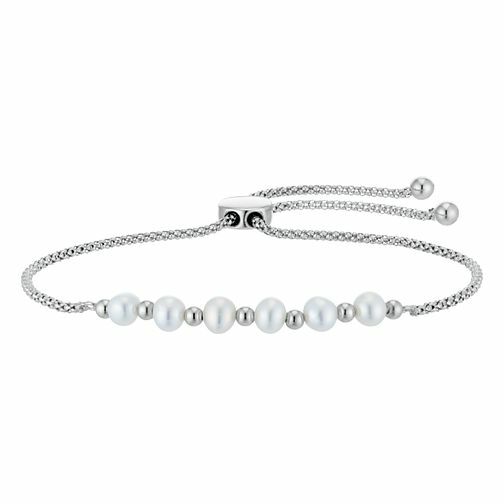 Elevate your look to a luxurious style with this bolo bracelet that is accented by pearls, secured with a bolo fastening and made with silver for a subtle style statement. Cultured Freshwater Pearl Silver Adjustable Bracelet is rated 4.5 out of 5 by 2. Rated 5 out of 5 by Anonymous from Beautiful! Absolutely gorgeous bracelet. The adjuster is really good quality so I'm not worried about it breaking or even the bracelet coming loose. Was the perfect gift for my mum, she loves it too.